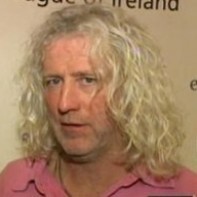 Mick Wallace is a builder and political activist who is running in the Wexford constituency. In the past he has used the site-hoardings of his company, Wallace Construction, as a platform for expressing his political views. Wallace is a keen football fan. His company motto, complete with football logo, is “Work hard, play hard”. Wallace is The Man…………………..Go Mick go……………….